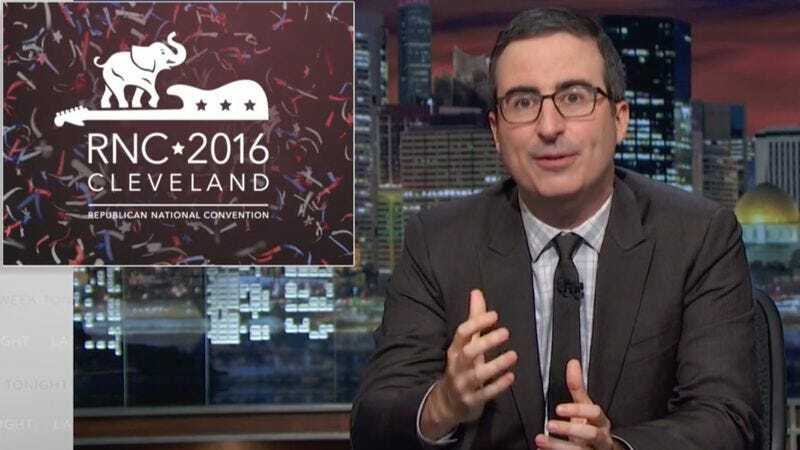 When Last Week Tonight With John Oliver went on hiatus just weeks before the Republican National Convention in Cleveland—a city which, we’re happy to report, manage to withstand the madness—it kind of seemed like bad timing. Surely, all the speech stealing and lack of Ted Cruz schmoozing, in addition to the general air of resignation, warranted an “all hands on deck” approach. The weekly show did return last night, with host John Oliver running down the RNC’s takeaways. What can Oliver (or anyone) really say about the 2016 RNC that hasn’t already been said? Well, repetition seemed to be one of the themes of the event, with Melania Trump “borrowing” from First Lady Michelle Obama’s 2008 DNC speech. But what Last Week Tonight took from the whole sorry mess was that Republicans are running on a platform of feelings versus facts—if someone “feels” the country is less safe now than ever before despite the fact that the FBI’s crime statistics indicate otherwise, then they’re not wrong. If a former Speaker Of The House feels that his incorrect statements about the validity of that constituent’s feelings are just as valid (if not more so) than whatever dull numbers you’re about to drill him with, then you’ll have to agree to disagree on the fact that you’re almost certainly wrong. Geez, no wonder the show attempted to sit this one out. If you can make your way out of that maze of inaccuracy, enjoy this clip of Cyndi Lauper, Heart, Usher, Michael Bolton (no, not that one), and more warning politicians not to use their songs to perk up their boring rallies.